One of our numerous drilling capabilities at Midwest Precision Manufacturing includes the custom drilling of bolt hole circle patterns to precision tolerances. The part shown here is a large A-106 steel paper roll that is used in the paper mill industry. The roll features heater holes that were produced to tolerances as tight ±0.003 using a gun drilling machining process. Gun drilling is ideal for creating holes less than 2.5" in diameter in ferrous and non-ferrous materials. 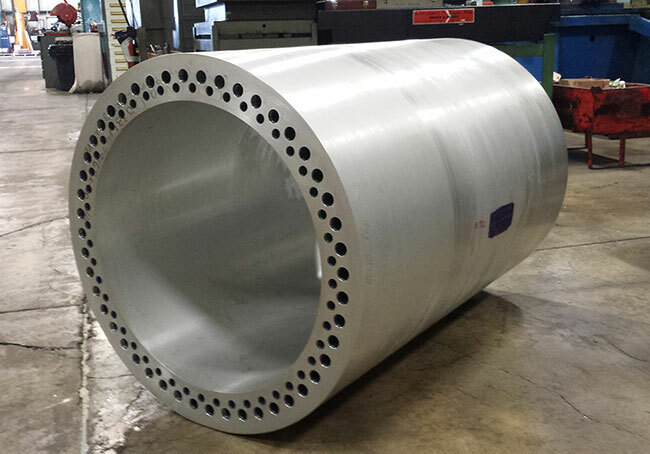 In this roll, there are 24 holes which measure between 0.787" and 0.789" located around the outer diameter of the part, while the 12 holes around the inner diameter measure between 0.755" and 0.757". These holes were drilled through the 80" length of the part. Additionally, two holes which measure 0.140" in diameter were drilled through a 26" length. Hole diameters and other critical dimensions were verified during dimensional inspections and the surface finish was verified to be within the requirement of 125 Ra. A total of 10 of these paper rolls were drilled for this project, with a total turnaround time of one week. For additional details regarding this custom bolt hole circle drilling project, see the table below, or contact us directly. Paper Roll - These are heater holes inside a larger paper roll. (24) Ø 0.787" - Ø 0.789" Holes through 88"
(12) Ø 0.755" - Ø 0.757" Holes through 88"
(2) Ø 0.140" Holes through 26"